FAYETTEVILLE, N.C. – Chemistry is crucial in the sport of hockey. From knowing where your linemate is on the ice, to having the solace of your goaltender’s ability on an odd-man rush. Chemistry can be difficult to build, and even among the most-talented players and rosters in the world, there might just not be a click. Chemistry, like many things, takes time. In the SPHL preseason Training Camp, there isn’t time to “take time”. It’s perform or get packing. Any advantage that one can have to have an extra edge on the ice, an extra ounce of motivation, or an extra touch of puck luck. Sometimes, advantages can come in the form of familiarity. 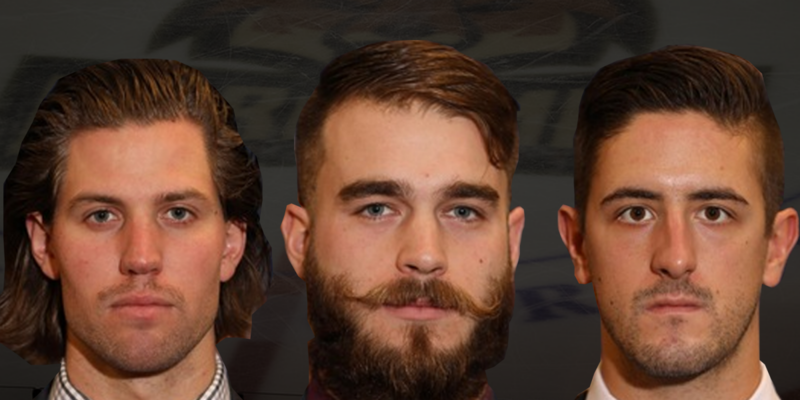 These three Marksmen roster-hopefuls all attended and graduated from NCAA DIII Salem State University, as four-year players for the touted Vikings Hockey team. During their time at SSU, the Vikings claimed back-to-back Massachusetts State Collegiate Athletic Conference Championships, for both the regular and post-season. Casale, the Captain in his final two years, registered 76 points (49G+27) in 92 games. Makimaa, his linemate, accumulated 71 points (36G+35A) in 98 games. Pucciarelli finished his senior year with a backup call-up to the ECHL Wheeling Nailers, after a career 2.60 Goals Against Average with a 91.4 save percentage. In their four years, these three grew incredibly close as both friends and teammates, which lead to their career’s ultimate opportunity here in Fayetteville. Captain Michael Casale reflected on their journey to Fayetteville. His linemate Derek Makimaa shared the sentiments of the captain. The final of the trio is the keeper of the backstop, All-MASCAC First-Team goaltender Jason Pucciarelli looked forward to attending camp with two familiar forwards leading the charge. As Casale had said, it was no coincidence that these three friends have all been invited to Marksmen Training Camp together, but there was some luck involved. When asked if the three had been contacted separately, or if it had been lead off an initial contact, the answer wasn’t direct. For three friends who were all close in their college days just to get their first chance at professional hockey together is truly something unique, and the Viking triplet is not taking it for granted. That’s not to say they haven’t considered what really being on the same team for another season would be like. Training Camp is a grueling eight days of anticipation, exhaustion, and hope for your number to be called for that Opening Night roster. 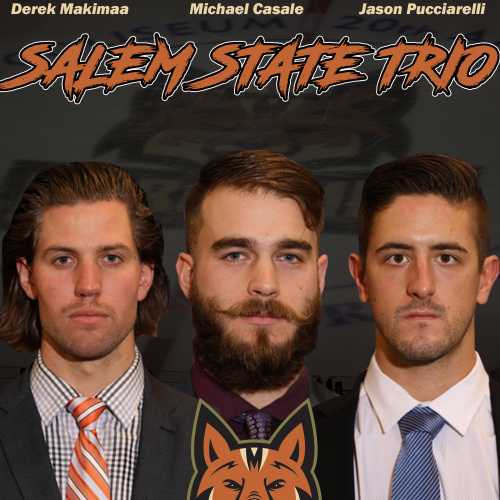 For the Salem State Trio, they go into the unknown territory with familiar faces, hoping to find their way to their first season of professional hockey together. The three players prepare with just under a month until the beginning of the Marksmen training camp, starting off on October 9. 39 days remain until the SPHL season begins, and the anticipation is starting to reach a fever pitch. The 2018-19 Marksmen Home Opener is October 19th against the Roanoke Rail Yard Dawgs, and Season Tickets are on sale NOW!